If anyone else would have directed those words at my daughter, I may have lost it. Erupted. But it was a three-year-old girl. An innocent, darling child, not capable of filtering her thoughts. The tears I wanted to cry crawled back down my throat as I put on my mom-voice. "This sweet little girl? Oh, no, honey. She is beautiful. This is my baby. This is my Elsa. She is so happy to meet you." Still, the child couldn't break away. She just looked and looked. Stared. Her eyebrows were worried. Things didn't add up. Something was wrong. Something had upset her. That something was a someone. That someone was Elsa. This sweet angel right here. Anyone who knows my oldest daughter knows that she's about as far from scary as you can possibly get. I have never in my life met a more gentle and loving person. Despite the fact that this is unequivocally true, the child didn't see that. Couldn't. What struck me most was not that she thought Elsa was different. I would never refute that. But that the word she chose was such a strong and hurtful one. Her uncensored label made me wonder to whom else Elsa is scary. Will she get more scary, in their eyes, as she gets older and becomes less of a child and more of a woman? The anger and sadness I felt in that moment was tempered by the fact that I was in a room filled with children, and that my two younger daughters were there, too: Elsa's bodyguards, who would do anything for their big sister. Frankly, they are borderline obsessed with her. Several weeks after the "scary" incident, I was out and about with all three girls. I noticed a young boy staring at Elsa in a less-than-positive way. Miss C, my middle, made my year in that moment: She hugged Elsa with all her might, and then hopped in Elsa's lap and shot the boy a look that said, "Are we going to have a problem here?" While I call Elsa 'gorgeous' and 'adorable' multiple times a day, I cannot ask or expect the world to find her so. Beauty is in the eye of the beholder, and I know that her beauty is unique. 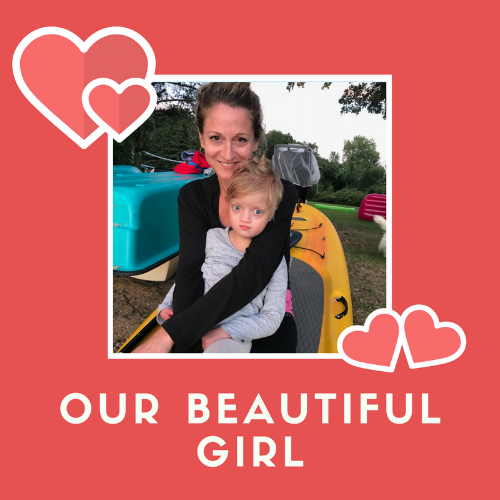 But I pray that anyone who meets her gives her a chance to show them her beauty - from her big blue eyes to her teeny tiny toes to the mighty heart in between.